You are here: Home / LIFESTYLE / Fashion / What Do Golfers Wear in Summer, Spring, and Winter? Golf courses have their own laws, one of them being a dress code. Many clubs have strict rules when it comes to clothing. The members have to follow a certain policy, but a collared shirt and a pair of Dockers-style shorts will usually do the job. What else do golfers wear? Is there a special attire for colder days? What about women’s clothing? Why do you have to wear special clothes in the first place? The origins of golf attire date back to the 18th century when it was first played in Scotland. It was not a sport for everyone. In fact, playing golf outside clubs was strictly prohibited, which indicated its eliteness. In 1794 Royal and Ancient Golf Society of St. Andrews was established and the first rules were created. They still form the basis of today’s golf, along with a certain dress code. 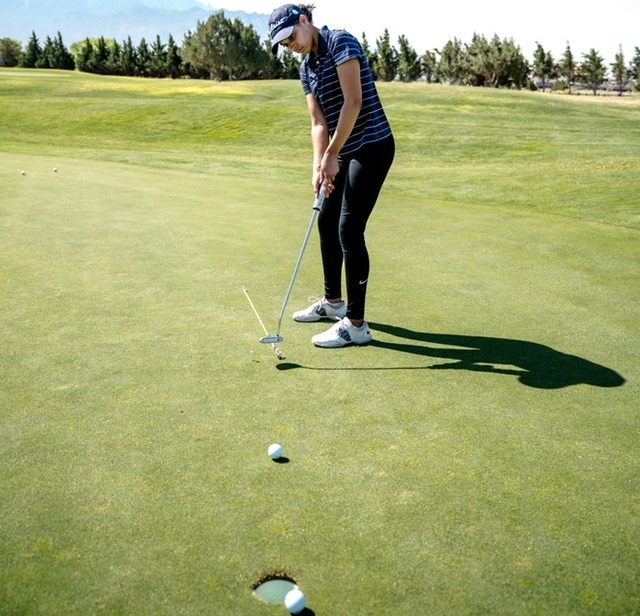 An online store selling professional golf apparel, The Golf Society, says that many golf clubs make their members follow certain rules when it comes to clothing. You cannot show up at the golf course wearing jeans or a leopard-print blouse. Besides, doesn’t this style of clothing make you look cool? We certainly think it does! So what exactly do golfers wear? When you think about it, most sport disciplines require some kind of outfit. Whether you are a tennis player, footballer or a ski-jumper – you are forced to invest in special attire. The same rule applies when you are a golfer – dress code (apart from the essential equipment) is your trademark. So what is it that you will find in every golfer’s closet? Collared polo T-shirt – it is an absolute must. One thing to remember is that your T-shirt has to have a collar! Don’t buy one with a huge logo or some other kind of banner. You should go for a synthetic material as it will allow sweat to evaporate on hot days. Shorts – providing they have belt loops. When it comes to color you may want to choose neutral shades such as khaki, beige or grey. Shoes – depending on your level of comfort you should either go for soft-spiked shoes or the spikeless ones. No sandals or trainers. Accessories – get a nice belt and an ankle-height pair of socks. You should also buy a cap as the Sun could be unbearable (for your own safety, please!). If you play long enough you may also consider getting a pair of gloves and wear only one in order to look professional, even if you are not. Shirt – the best and easiest option is a polo T-shirt with a collar (just like for men). Some golf courses allow sleeveless tops. In hot weather, you should choose technical materials and bright colors that will not absorb much heat. Bottoms – you have a great choice here: shorts, a skirt or skort. You may want to choose stretchy fabrics as they are more comfortable. The length is usually determined by a golf club. Shoes – soft spikes or spikeless, these are the best two options. If you are a beginner the golf course may allow trainers. Golf sandals are also acceptable. Accessories – you should always wear a hat or a cap in hot weather. Sunglasses are also a good idea. Cold weather is not an obstacle for a real golfer. Enthusiasts can play all year round. But… you need to know what to wear as the apparel differs from the thin summer clothing. Shirts – both men and women need to wear layers of clothing and the best option is, of course, a long sleeved shirt. A collar is a must. When it comes to fabrics, cotton will be a much better option as it will keep your body warm. Chinos and pants – long trousers with belt loops are essential in cold weather. Shoes – shoes can be worn all year round. For lower temperatures, you may want to go for high-ankled ones. Jackets – on rainy days you should wear a long raincoat or a windbreaker with a hood. There are rules when it comes to golf gear. After all, it is an elite sport and you really do not want to look amateur. From colors, fabrics to styles – all of this matter if you want to fit in. Choosing your golf apparel can be fun though, you can mix and match depending on what look you are going for. Be yourself and let your clothes express both your skills and attitude. Good luck!